The Breitling Chronomat 44 is a remarkably robust pilot's watch with chronograph functions. It is even suitable for diving and is water resistant to 500 m (50 bar, 1,640 ft). Top models feature a second time zone or are made of solid gold. 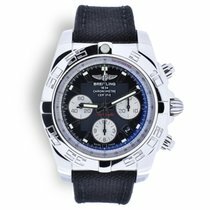 The Breitling Chronomat 44 is one of the most robust and functional watches offered by the Swiss watch manufacturer Breitling. At 44 mm in diameter, it catches the eye no matter who's wearing it. The rider tabs at 3, 6, 9, and 12 o'clock are this chronograph's most striking feature. Thanks to these four small protrusions, the unidirectional bezel can even be operated while wearing pilot's or diving gloves. The Chronomat 44 is water resistant to 500 m (50 bar, 1,640 ft) and is always ready for the next dive. Current models are equipped with the automatic in-house B01 caliber with a 70-hour power reserve. Top models also include a GMT function. One highlight in this collection is the Chronomat 44 GMT 50th Anniversary Patrouille Suisse , which was created in celebration of the world-famous Swiss aerobatic demonstration team's 50th anniversary. This timepiece had a limited run of only 1,000 pieces. Unlike Chronomat models without a GMT function, this anniversary watch includes a fourth central hand that displays the time in another time zone. This pilot's watch costs around 8,900 USD in mint condition. On the other hand, fans of black watches should enjoy the Raven and Blacksteel collections. 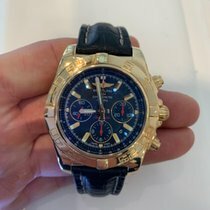 How much does a Breitling Chronomat 44 cost? 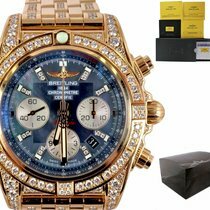 A stainless steel Breitling Chronomat 44 in mint condition costs around 6,100 USD. You can get a pre-owned model for about 4,600 USD. Bicolor variants in stainless steel and gold come in at just over 10,700 USD new and 8,500 USD pre-owned. Never-worn examples made of 18-karat gold demand around 42,600 USD. You can purchase a Chronomat 44 GMT with the B04 caliber for between 6,900 and 8,000 USD depending on its condition. If you're looking for a state-of-the-art in-house chronograph with a retro feel, look no further than the Airborne edition of the Chronomat. Its design is more inspired by watches from the 1980s. Plan to spend a good 6,700 USD for a piece in mint condition. Pre-owned watches cost about 1,800 USD less. The Airborne is also available in a smaller, 41-mm size. These timepieces cost between 4,600 and 5,400 USD. Those who can do without the in-house B01 caliber should also take a look at older models such as the Chronomat Evolution and the Chronomat Blackbird. These watches are powered by either the Breitling caliber 13, based on the Valjoux 7750, or the caliber 44, based on the ETA 2892. Earlier versions of the Blackbird have an outsize date beneath the 12 o'clock position, which sets them apart from other Chronomat models. A satin-brush finished also characterizes the Blackbird, as most Chronomat cases are polished. You can purchase a pre-owned Blackbird for as little as 2,700 USD. A pre-owned Chronomat Evolution costs around 3,700 USD. The Chronomat 44 Raven and Blacksteel are the ideal choice for fans of black watches. The Raven's bright orange accents immediately catch the eye: The Arabic numerals on the bezel, subdial hands, stop seconds hand, and rehaut all have this mesmerizing hue. Even the inscriptions of the black winding rotor are orange and easy to see through the sapphire glass case back. Plan to spend around 6,800 USD for a mint-condition Chronomat 44 Raven. Pre-owned pieces are somewhat less expensive at around 5,800 USD. Thanks to its almost solid-black design, the Chronomat 44 Blacksteel is a bit less conspicuous. Even the numerals on the bezel are black, underscoring the watch's stealthy appearance. The red stop seconds hand and red subdial hands add a small splash of color. The beige-colored luminous material on the hands, indices, and the bezel's zero marker offers a bit of relief as well. Like the Raven, this watch also has a sapphire glass case back, through which you can admire the movement B01 with its black winding rotor. New, this watch costs around 7,800 USD. Pre-owned pieces go for about 6,000 USD. The Blacksteel Special Edition features a yellow and black dial and comes on a rubber strap. It demands prices of about 8,000 USD new and 7,300 USD pre-owned. The Chronomat Blacksteel is also available with a GMT function, making it possible to keep track of the time in a second time zone. Its case is 47 mm in diameter, and the in-house caliber B04 ticks away inside of it. Setting the second hand forward or backward to match the local time couldn't be simpler. Plan to spend around 7,900 USD on a model in mint condition and 6,800 USD on a pre-owned timepiece. The Breitling Chronomat 44 is the perfect watch for long-haul pilots. Thanks to its GMT function, the watch can display the time in two time zones at once. This is especially practical if you often fly back and forth between time zones. The usual hands for the hours and minutes show the current local time. Since the Chronomat 44 GMT is a chronograph, it has a small seconds dial. The central second hand serves as the chronograph second hand. There is also a second hour hand which makes one full rotation every 24 hours. It is responsible for displaying the second time zone, such as the time back home. A 24-hour scale on the edge of the dial and the bidirectional bezel make it easy to read the second time. The in-house caliber B04 powers the Chronomat 44 GMT. This movement is based on the B01 and adds a GMT function. Therefore, many of the key features are the same, such as the 70-hour power reserve and balance wheel frequency of 28,800 A/h. The GMT watch is water resistant to 200 m (20 bar, 656 ft). For the case, you have the choice between stainless steel and a combination of stainless steel and gold. The dial is available in black, blue, gray, brown, or silver. 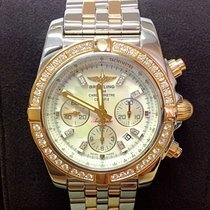 Breitling offers either a five-link stainless steel band or a leather or rubber strap to keep the watch on your wrist. The Chronomat 44 Raven and Blacksteel bring a different look to the series. Both models are predominantly black; the Raven is especially eye-catching. The numbers on its bezel, as well as the chronograph second hand and the subdial hands, are bright all orange, creating a dynamic contrast with the black case and dial. The edge of the dial also pops in the same orange and features a tachymeter scale, which you can use to calculate average speeds. Domed sapphire glass with anti-reflective coating on both sides protects the dial and provides a clear view. Scratches are essentially a thing of the past thanks to the sapphire glass, as it is almost as hard as diamond. Thanks to the sapphire glass case back, you have a clear view of the black rotor, which automatically winds the in-house caliber B01 when the watch is on your wrist. The orange inscription "Breitling – Chronographe Certifie Chronometre" on the rotor contrasts with the otherwise black piece. The caliber is certified by the Official Swiss Chronometer Testing Institute, ensuring it runs incredibly precisely. The caliber's power reserve lasts around 70 hours; this means you can take your watch off for the weekend and put it on again on Monday and it will still run perfectly. The chronograph is water resistant to 200 m (20 bar, 656 ft) and features a rubber strap. As its name suggests, the Breitling Chronograph 44 Blacksteel is almost entirely black. The red chronograph second hand and the three red subdial hands are some of the only discreet splashes of color on this timepiece. The three square-shaped subdials jump out at you. Like the Raven, the Blacksteel is protected by sapphire glass. It also has a sapphire glass case back, giving you a perfect look at the heart of the watch. The in-house B01 movement powers the chronograph and features a striking and unique black rotor which immediately draws your attention. Last but not least, Breitling gave the watch a bit of a military touch with their selection of a black textile strap. The Swiss manufacturer Breitling developed their Chronomat collection for pilots. The name of the series is a combination of the words "chronograph" and "mathematics." A chronograph is a watch with a stopwatch function; with such an instrument, you can time events and calculate speeds. The second half of the name refers to the watch's use as a slide rule, which first came into play in the early 1940s with the first Chronomat models. Using this watch, pilots could multiply, divide, convert units of measurement, and calculate distances. The Navitimer, introduced in 1952, improved on this calculation mechanism. It was possible to calculate average values, gains and losses in altitude, and fuel consumption of an airplane with the Navitimer chronograph. The Chronomat came back with a whole new design in 1984. Since then, its look has barely changed: The watches in this collection still have the four characteristic tabs on the bezel at 3, 6, 9, and 12 o'clock. They function like grips, making it easy to turn the bezel even if you have gloves on. Furthermore, both the crown and push-pieces are onion-shaped. Thanks to the double gasket crown, the timepiece is water resistant to 100 m (10 bar, 328 ft). Today, the Chronomat 44 has even more to offer in terms of waterproofness. The chronograph is water resistant to 500 m (50 bar, 1,640 ft), making it a genuine, hardy diving watch. However, if you're looking for a watch for extreme depths, you should consider the Superocean Chronograph M2000 from the Superocean series; it is water resistant to 2,000 m (200 bar, 6,562 ft).